Ductless air conditioning and heating systems, also called mini-split units, are an excellent alternative to window units, central air and radiators. John G. Webster is proud to offer residential ductless systems and mini-split cooling units, both sales and installations, throughout Washington, DC, Maryland and Virginia. Tired of window units and radiators but don’t have the space or budget to install ductwork throughout your house? Need an alternative to noisy window units that compromise safety and turn off and on through the night? Have an addition, office or converted garage that needs heating or cooling? Ductless systems and mini-split units are the perfect solution! 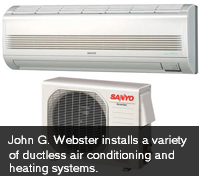 John G. Webster installs ductless systems and mini-split units throughout the Washington area. Our knowledgeable sales team will determine the best make and model for your home, and our skilled HVAC technicians will expertly install your new system quickly to get you and your family comfortable fast! We only sell and install top-quality, brand-name equipment, and our budget-friendly service agreements will keep your new ductless system or mini-split unit operating at peak performance, saving you both inconvenient breakdowns and expensive repairs down the road. Interested in a ductless system or mini-split unit? Contact us today!